In this short post, we are going to discuss the different features and characteristics of the Java String class. We often deal with a lot of text in many applications. It can be a simple “welcome”; message to a website. Strings are a group of characters enclosed between double quotes (” “) like “Welcome“, “success”, “[email protected]!2” etc. The Java String is an immutable class in the default Java package java.lang which is available for every Java file (You don’t need an import statement for this.). Let’s take a closer look at a few important aspects of the String class. 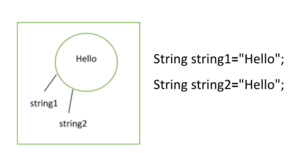 There are 2 ways to create a String Object. The former will always create a new String object using the new operator but when literal values are directly assigned as shown in the second way to a String it may or may not create an object due to the concept of String constant pooling in java. Memory allocation happens for any object irrespective of String class when created using the new operator String string=new String("Hello");. String Pool provides a better memory allocation when using Java String literal values. When a String object created directly by assigning literal values then the memory allocation happens only once by the JVM so, that the same reference can be referenced again when another String object with the same literal value requested instead of creating a new String object. Let’s take a look at some of the most important methods available in the String class. While it seems that this class is modifying the String object, but keep in mind that String class is Immutable which means cannot be modified after Initializing. Method charAt(int index) query the String for a character at a specific place. To understand, let’s take an example of this String literal. So, for the above String, the method string.charAt(2) returns the character at index 2 which is ‘v’. Notice that the Index for strings starts from 0. The methodindexOf() has multiple overloaded versions which are used to get the index of the argument passed to the method. string.indexOf('v') returns the index 2 which is the first index of ‘v ‘ stored in the string.string.indexOf('V',3) returns the index 6, as the second argument is used to specify the start position to search which is 3.The string.indexOf("dev") returns the starting index of substring “dev” in the string “javadevjournal” which returns the index 4. All the indexOf() methods return -1 when the substring or the character searching for is not found. This method is useful to trim the leading and trailing spaces if any in the String. Let’s take following String for our example. string.trim() prints the output as “javadevjournal” removing the spaces at the start and end of the string. This method cannot remove spaces between the string. The length() method returns the length of the String. If we run this against our sample String “javadevjournal”, this method returns length as 14. This method is useful to concatenate the strings.Let’s take a look at the following example for better understanding. While running this example, it prints the output as “javadevjournal”.All the above methods return new String objects and won’t modify the existing initialized String objects as they are immutable. For example, if you print the string used in the concat() method example after concatenating it still prints “javadev”. Java 8 came with a number of improvement. Refer to the Java 8 StringJoiner for more detail. In this posts, we talk about the different features of the Java String class. Strings are immutable objects and cannot be modified once initialized. String class has many built-in methods which return new String object instead of modifying the existing one. String constant pool helps avoiding java.lang.OutOfMemoryError by using efficient memory allocation algorithm if using the same String literals. Refer to String (JDK Documentation) for more detail. Rakesh pursued Electrical engineering and a software developer by profession. He likes to travel across different places in India.